The first non-native settlement in the area was by a family of freed slaves following the American Civil War. In 1888, a group of men from Cocoa bought the entire tract of land, which went undeveloped until it was bought out in 1923 by a member of the group—Gus Edwards, Cocoa’s city attorney. At that time, Edwards’ total holdings included approximately 600 acres (240 ha), and he had stopped practicing law to devote all his efforts to developing the area. Prior to incorporation, the area was known as Oceanus. 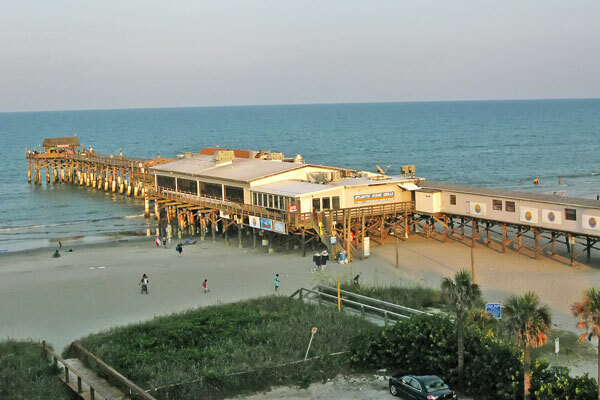 The Town of Cocoa Beach was established on June 5, 1925. Cocoa Beach’s first official meeting was held at the Cocoa Beach Casino on July 27, 1925, and adopted the City Seal. Gus C. Edwards was elected as mayor and served as a commissioner along with J.A. Haisten, and R.Z. Grabel. A little less than a month later, plans for a pier became official. In 1935, the FDOT opened up what is now State Road A1A as a one-lane dirt road to Eau Gallie. In 1938, a Deputy Marshal was appointed “to act in emergencies at night or at other times” for $.25/hour. By 1939, the town had 49 residents. In 1940, the town requested that State Road 140 (now A1A) be routed on Orlando Avenue instead of Atlantic Avenue. In 1942, the town prepared to receive men assigned to the newly opened Naval Air Station Banana River. Establishing regular garbage collection was discussed when the town discovered that the Air Station was having theirs collected. On May 1, 1942, the German submarine U-109 torpedoed the La Paz off the shore of Cocoa Beach. The crew was able to beach it with the help of tugs. Eventually it was returned to shipping. On May 3, the same U-boat sank the SS Laertes near the same spot. Local boys were recruited for salvaging efforts and to rid the beach of subsequent debris. Shortly thereafter, the federal government realized the danger of back-lighting from the coast making easy targets of passing ships and ordered a blackout for the remainder of the war. During World War II, Cocoa Beach experienced money shortages for employees, and money to fix roads. In 1944, the town successfully fought a bill introduced in the Florida legislature which would have dissolved the city government. In 1947 a single police officer was hired for $1/hour. The same year, the city constructed works for the distribution of potable water. In 1950, a volunteer fire department was created which used a second-hand vehicle. In 1950, a proposal to prevent people from driving on the beach was defeated. In 1951, the city sought to place a stoplight, the city’s first, at the intersection of what is now A1A and Minuteman Causeway. In 1953, the city decided to mark the names of all streets. In 1953, the city planned to pave A1A south from 520 down Orlando Avenue. The city intended to bear 1/3 of the costs, the adjacent property owners, 2/3. In 1954, the Women’s Club opened a library in the building used by the Fire Department. In 1955, the speed limit in most of the town was raised to 35 miles per hour (56 km/h). In 1955, the city prepared to house the people who were going to be launching missiles from what is now Cape Canaveral Air Force Station. In 1956, the city attorney warned the council that blacks might attempt to use the beach. If they did, he recommended clearing the beach of all persons, both white and black. The 1954 decision, Brown v. Board of Education, had, in theory at least, integrated all general public facilities. Actual integration came later. The city proposed selling the town dump to the school board for a junior high school, in order to keep students from being bused to Merritt Island. On June 29, 1957, the town of Cocoa Beach incorporated into a city. In September 1959, the city voted to add more sidewalks, improve the streets in residential areas as well as the main streets, and to pave more roads. In 1965, Cocoa Beach High School requested that Cocoa Avenue, the street that the school was located on, be renamed Minutemen Boulevard, in honor of the school’s mascot, the Minuteman. Cocoa Beach started its major growth during the 1960s (1000% population increase from 1950 to 1960) as a result of America’s space program. NASA’s John F. Kennedy Space Center is located approximately 15 miles (24 km) north of town. Many people moved to Cocoa Beach due to jobs connected to the space program and in search of new opportunities. After NASA’s Apollo program came to an end, and before the Space Shuttle program was in full swing, the town’s economy reflected the resulting layoffs. At one point, in 1975, unemployment was 14.3%. Many families lost their jobs or simply moved away. The housing market plummeted and some people unable to sell their homes simply abandoned them. Cocoa Beach was the setting for the 1960s sitcom I Dream of Jeannie, although no episodes were actually filmed there, and star Barbara Eden only made two visits during the show’s production — both in 1969, for publicity. Cocoa Beach High School was used as the school in the 2002 movie Race to Space. The 2010 Nebula Awards were held in the city.